The vibrant city of Burlington is a perpetual hub of activity, with hordes of shoppers strolling up and down Church Street and groups of college students scattered about the lawns of UVM. Stop and listen to the stories of Queen City Ghostwalk guide Thea Lewis, and discover the ghostly shapes and spirits that appear among the throngs of the city's living. Meet the mischievous poltergeist who haunts Converse Hall and the ghost of the Flynn Theater. Take a peek at peculiar happenings at the Firehouse Center or the old Howard Opera House. Lewis delivers plenty of chills with a strong dose of history and a pinch of humor. Thea Lewis is the owner and tour guide for Queen City Ghost Walk. 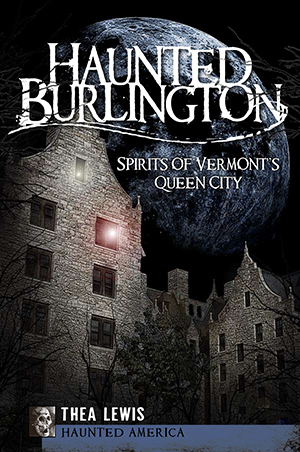 She is the author of HAUNTED BURLINGTON (2009). She works for WCAX-TV and is also active in the chamber of commerce in Burlington.